A global customer contacted us with a requirement for an industrial wash bay canopy for their site in Eye, Suffolk. Due to limited space, the canopy needed to be tapered and feature wall-attached cranked posts and so we were chosen by the customer as we specialise in custom designs that are steel and built-to-last. The industrial wash bay needed to be enclosed on one side to protect the workforce from high prevailing winds. 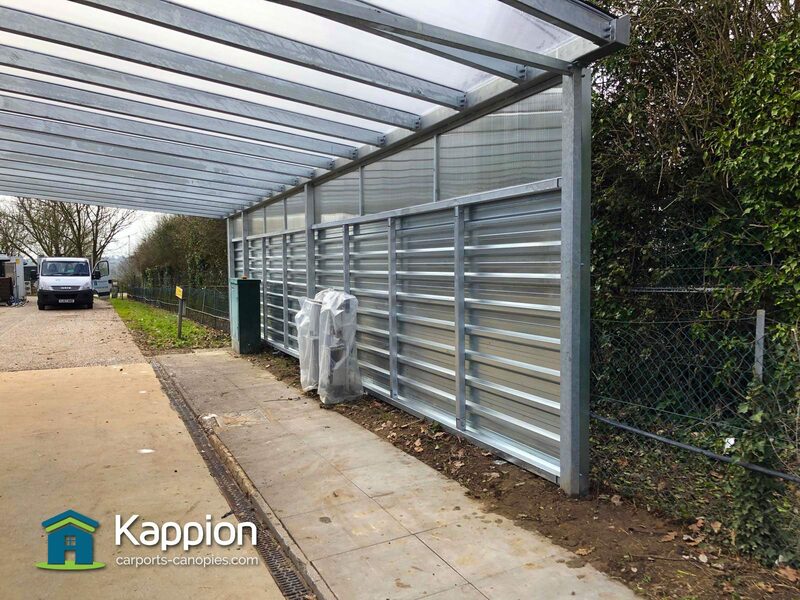 At Kappion, our specialist design team architected this canopy so that a combination of trapezoidal steel sheet and clear polycarbonate could be utilised to form a wall. 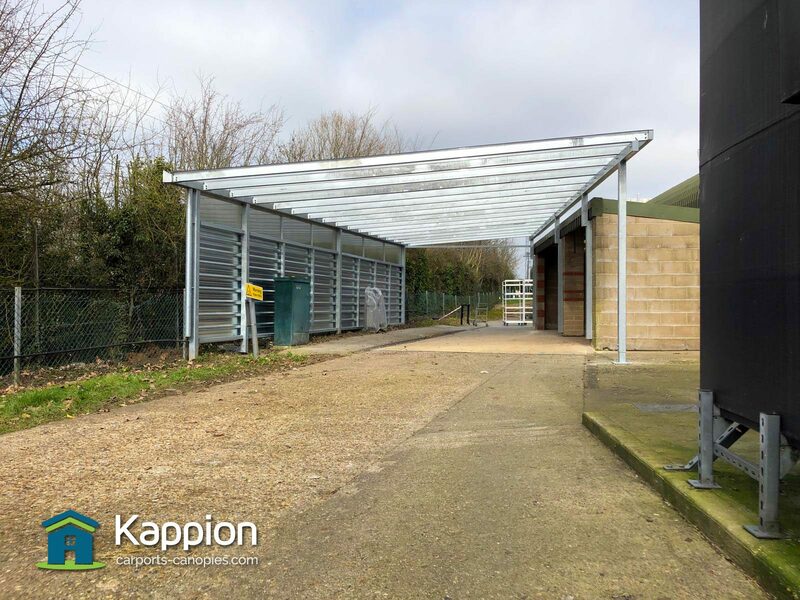 Our objective, which was met, was to provide a structure and protection whilst allowing light into the industrial wash bay through the clear polycarbonate windows, situated above the steel trap sheet. Following our estimate, we efficiently organised a site survey so that we could check the ground, site and determine final post positions and measurements. Following this, our surveyor and client established that the posts on the right-hand side could be bolted to the concrete surface and be attached to the wall of the adjacent building. Regarding the left-hand side, we determined that we would have to excavate the ground and sink the posts into concrete piers. After consulting our structural engineers we calculated a price for the final solution, including installation, full structural calculations and all of the customisation such as the varying widths, infills and cranked posts. Our very competitive price was accepted and we organised the bespoke CAD drawings, which quickly became production drawings following a few minor revisions and great communication with our client. 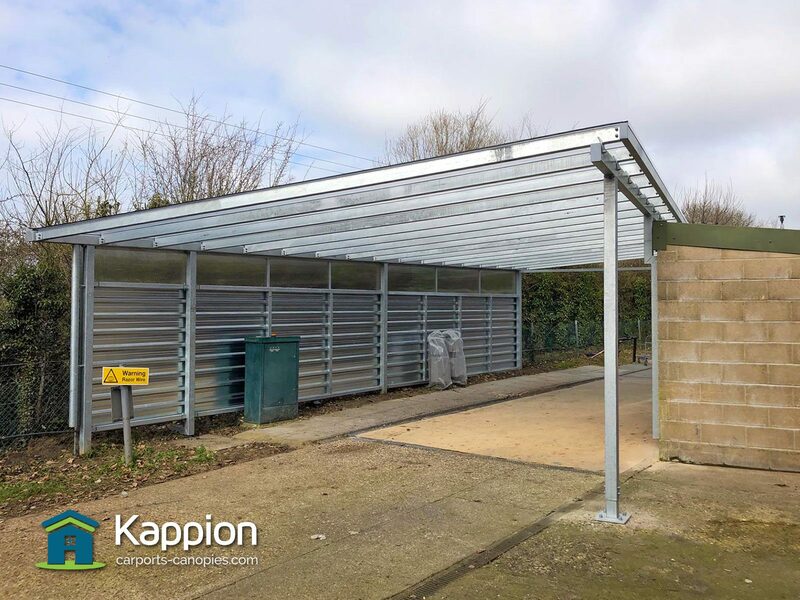 Once the industrial wash bay had been manufactured, our project management team organised a suitable date for the canopy to be installed, which needed to fit in with our customer’s busy schedule. The installation was completed in three days and it was evident that our client was more than happy following their inspection; so happy that they are having another canopy from us! Thinking about purchasing an industrial wash bay canopy? If you would like more information please get in touch. If you would like to request an estimate please use our Get a Quote! enquiry page.